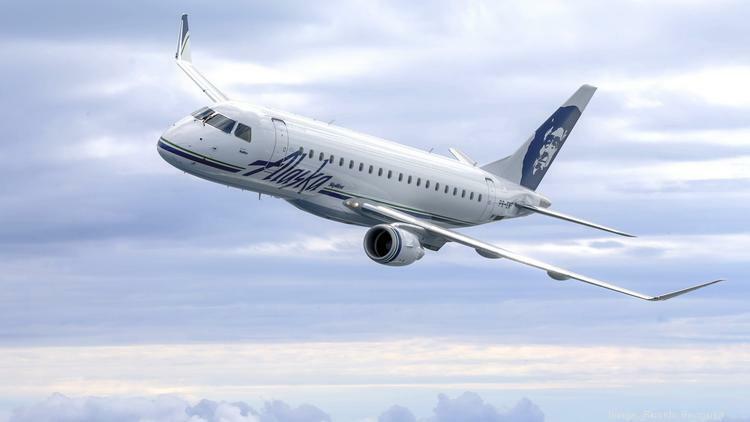 Alaska Air Group announced that it is placing an order for up to 30 large regional jets in the first quarter of 2016, with deliveries expected to begin in 2017. The new aircraft will likely have 76-seats and will be flown by Alaska’s wholly-owned regional airline subsidiary Horizon Air, making Horizon Air the latest turbo-prop only airline to join the Regional Jet Age. Alaska executives did not say what specific type or manufacturer of aircraft Horizon will be flying except to say that they plan to outfit the new aircraft with three seating-class cabins. Pedersen and other Alaska executives say larger regional aircraft will enable Alaska to continue adding profitable routes to its network. New aircraft in the 76-seat range include current-generation models like the Bombardier CRJ900 and E175 and next-generation models like E175-E2 and Mitsubishi MRJ70 and all aircraft are good candidates for the Alaska purchase. The purchase of these new aircraft create even more new opportunities for pilots who have prepared themselves to take advantage of the chance to have a lucrative career flying for the airlines as thousands of people are now doing. The people who will be most successful at pursuing these lucrative careers will make the best choice on where to go for the best flight training available. The flight training organization with the time-proven record of successfully training career-oriented pilots for the airline industry is ATP. The decision of where to acquire your flying skills is the most important decision you will face when considering a career in the airlines, the best decision is to train with ATP.